The VWR Vortex Genie 2 Vortex Mixer is ruggedly constructed and built to last. This popular vortex mixer comes with a 3” flat platform head that will handle just about any single flask or test tube users need, and is constructed of chemically resistant thermo plastic rubber. The die cast metal housing of this lab vortexer has just enough weight and rubber feet to keep the instrument from walking away while in use. 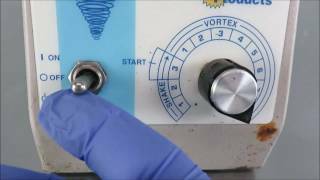 The VWR Vortex Genie 2 gives users the option of gentle low speed shaking to a more vigorous vortexing through 10 level with a range of 600-3200 RPM. This lab mixer also gives users the option of continuous shaking or touch on control, simple press the test tube into the cup to activate, then release pressure to stop. This Scientific Industries Vortex-Genie 2 Lab Mixer has been thoroughly inspected and performed as expected. Should you have any questions, please don't hesitate to contact us!